Creamy and delicious; brush it with rum. Okay so here it is: my partner is lactose intolerant to a violent degree and I love him enough to not let that stand in the way of our happiness. Cooking and eating a dairy-free lifestyle is oddly easy, once you know what you're doing, and you'll slowly start to wake up from the spell that you have to have dairy-milk every day. Sure, it's great when you're a kid, but here's the thing: it's the breast milk of another animal. We can't even handle breastfeeding in our own species, and yet the average American guzzles 199 pounds of a four-legged mammal's breastmilk per year. Yeah, dairy milk is awesome, but it's not the end-all, be-all. The spell that it has so many of us under is so thick it's a little staggering; we won't even try other milks, even though they're often just as good in many different ways. Anyway. We have a lot of great milks available for baking, for drinking, and many of them can be nut-free. I really like rice milk for drinking, and coconut milk for baking. B, my partner, really loves the almond-coconut milk blends, because it is the closest thing we've found, in his mind, to the regular dairy milk. I've had pea milk before, and I love it for savory cooking - such as mashed potatoes! The point is that there are so many non-dairy options available that there's really no reason to be consuming dairy milk. Nowadays, thanks to modern science, they've come up with all kinds of dairy-free substitutes for milks, cheeses, sour creams, and butters. I've got my favorites, of course, but your best bet is to try different kinds and see what you like best. And you know what? They work just fine for baking; and take it from me - I was a Pastry Chef for 3 years! Toss the melted butter, coconut sugar, and graham cracker crumbs together and press against a 10" springform pan to form a crust. Bake the crust at 400 degrees F for five to seven minutes, just until it's set. Remove the crust from the oven and lower the temperature to 300 degrees F. Take a cake pan of any shape and size and fill it with water, then place it in the bottom rack of the oven; this will help. For the custard, beat the cream cheese in the bowl of a standing mixer with a whisk attachment until smooth, then add the vanilla paste and sugar. Mix until creamy and smooth, then turn the speed up to high to make the mixture rather light and fluffy. Add in the egg yolks, one at a time, and let them incorporate fully before adding the next one. When the yolks are fully incorporated, scrape down the bowl, mix for a little longer, then add in the sour cream. Whisk together until fully incorporated, smooth, and shiny, and give it a little taste - does it taste like cheesecake? Would you like to add a little lemon or orange zest? You can; it's your cheesecake, after all. Pour the custard into your crust and give it a gentle tap-tap-tap on the bottom to pop out any big bubbles there might be. Pop in the oven in the middle rack, directly over the pan of water on the bottom rack, and bake at 300 degrees for 45 minutes. After 45 minutes, give it a very gentle shimmy in the pan; if it seems liquid in the middle, let it go for about 10 minutes before pulling it out. When it's just set, turn off the oven and crack the door open; let it sit in the nice warm environment for at least another 15 minutes before removing from the oven entirely. Let the cheesecake chill in the fridge for at least a few hours before cutting into it; overnight, of course, is best. You can also freeze the cheesecake for up to a month and thaw it in the fridge overnight for when you want it. To serve, run a small, sharp knife around the outside edge of the pan and pop it away. This cheesecake serves 12 very attractive slices, and you can top it with a berry compote, non-dairy whipped topping, or just eat it plain with a cup of coffee. 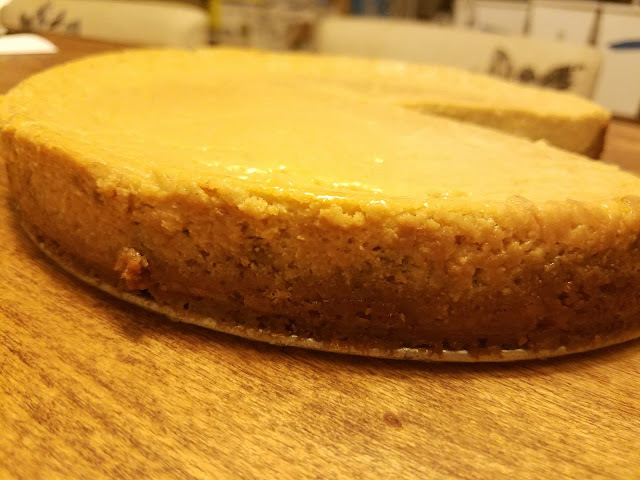 It's an extremely tasty cheesecake with just a hint of coconut flavor from the sugar. Oh, sure, you can use cane sugar, but coconut sugar is a much more sustainable alternative, and has a lovely depth of flavor. Even better, brush it with rum and flambe it. You're an adult; you can do what you want.